Hatters boss Nathan Jones believes striker Danny Hylton will be raring to go against Cambridge United this weekend. 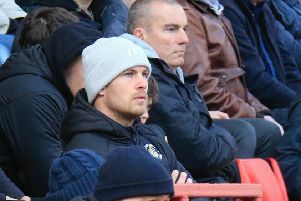 The summer signing from Oxford had played every minute of every game until being withdrawn after the hour mark against Leeds United on Tuesday night, with Jones admitted he had looked jaded during the match. However, Hylton is expected to start against the U’s this weekend as Jones said: “It’s the amount of work he does, you have to try and stop him running at times, even in training when he’s on a down day he’s probably still covered distances that we wouldn’t want him to cover. “He’s just like a machine, all the time, he wants to do stuff. The way he’s picking up bookings he’ll have a rest before long, but he’ll be ready (on Saturday). “He looked a bit jaded, wasn’t himself, but he’d run himself into the ground and that’s what we didn’t want him to do on Tuesday. Striker partner Jack Marriott missed two glorious chances on the night, firing wide when clean through, but Jones doesn’t believe it has had an adverse affect on him in training. The boss continued: “His build up play, his movement to get those chances is Premier League movement, it really, really is. “To do that to a Championship centre half in terms of his movement to get clean in is top end stuff. “Yes, if he scores every chance you get when his movement’s like that, he’s Premier League, so we understand that. Skipper Scott Cuthbert echoed his manager’s thoughts, adding: “He’s a young lad, it happens, he’s a goalscorer, he lives on goals, so he’s naturally going to be disappointed. “But he’s a confident lad and all the senior lads will get their arm round him and tell him not to worry, the coaching staff too.